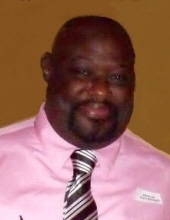 William “Wil” T. Powell of Fredonia passed away at his home on Wednesday, January 30, 2019 at the age of 52. He was born to Taylor and Armareatha Powell on May 26, 1966 in Chicago, Il. Wil was united in marriage to Lisa Maas on August 18, 2007 at St. John’s Lutheran Church in Fredonia. Wil graduated from Pius XI High School in 1985. He had a great love for sports, and it mattered not how the Green Bay Packers, Brewers or Badgers were doing, he always stood behind them. Wil had a special place in his heart for wrestling and trained in the Milwaukee area to become a professional wrestler. He worked for several local companies including Mid America, Badger State, Power House Pro Wrestling, SWE and in 2013 he and his wife Lisa started Main Event Pro Wresting. In 2016 they ran monthly shows at what is now the Kyotes Bar & Grill in Belgium. Wil’s family would like to extend a heartfelt “Thank you” to all the fans that showed up every month and made MEPW successful. Wil is survived by his wife Lisa, his daughter Taylor Powell, his mother Armareatha; inlaws, Roger and Joan Maas; siblings, Daphnie Morris, James Morris and Ranard (Kathy) Morris; brothers-in-law, Lloyd Maas, Kenneth Maas; niece, Kristine Maas; nephew, Dylan Maas. He is further survived by other relatives and friends. He was preceded in death by his father Taylor, his brother Roger Morris and his grandparents. A Memorial Service will be held at 1:30PM on Saturday, February 9, 2019 at St. John’s Lutheran Church (824 Fredonia Ave. Fredonia, WI 53021) with Pastor Marshal Frisque presiding. Visitation will be at the CHURCH from 11:00AM until the time of service. The Eernisse Funeral Home of Port Washington is honored to assist the family. To send flowers or a remembrance gift to the family of William Taylor Powell, please visit our Tribute Store. "Email Address" would like to share the life celebration of William Taylor Powell. Click on the "link" to go to share a favorite memory or leave a condolence message for the family.